From within two years of passing the motorcycle theory test, you must pass both the off-road module 1 and on-road module 2 riding test and hold a current compulsory basic training (CBT) certificate unless you’re upgrading a full motorcycle licence but in a lower category. Different rules apply under progressive access. At the beginning of the motorcycle module 2 test, the examiner will introduce themselves. The examiner will be professional and courteous and will ask you to sign the declaration section on the Riding Test Report form, also know as ‘DL25MC’. The examiner will also ask to see your documents. You must take these documents with you. They include your driving licence. This must include your photograph on your licence. If your licence doesn’t contain a photo, you must provide a valid passport. Unless you have upgraded your licence under progressive access, you must also show your theory test pass certificate. The examiner will also require your module 1 test pass certificate and also your CBT completion certificate (unless you are upgrading your full motorcycle riding entitlement). When the documents have been checked and the declaration signed, the examiner will fit you with a radio system enabling you to communicate with each other whilst out riding. The examiner will make checks to ensure the equipment is working correctly and will explain to you how directions will be given over the radio during the module 2 test. Over the radio, you’ll be directed by the examiner. During the test, the examiner will follow behind you either on a motorcycle or in a car. Safety check and balance questions – otherwise known as the motorcycle Show Me Tell Me questions. At the start of the test, the examiner will ask you one ‘show me’ question and one ‘tell me’ question. You’ll also be asked questions about balance and taking a pillion passenger. 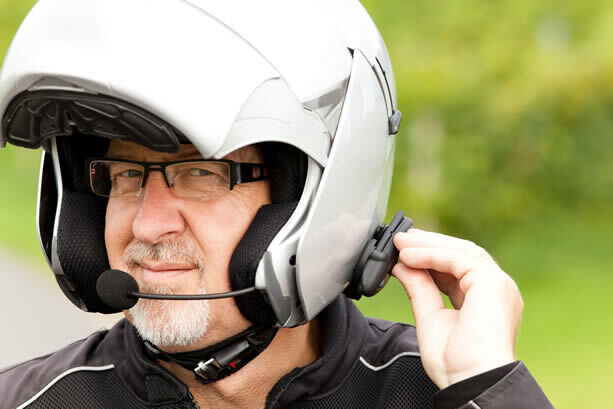 Moving off – the examiner will check to ensure you have the motorcycle appropriately prepared before moving off and that all observational safety checks have been completed. Angle start – the motorcycle angle start requires the examiner asking you to pull up just behind a parked vehicle. You’ll be required to move off at an angle whilst taking appropriate observation. If this manoeuvre occurs during the general course of the test, it may not be requested. Hill start – the examiner may ask you to pull over on an uphill gradient. You’ll need to demonstrate that you can pull away under full control, without stalling the engine or rolling backwards (clutch control and bite point). Rear observation – the examiner will be checking to ensure you’re using the OSM PSL routine and that you’re correctly using the mirrors and blind spot (when needed) before a change in speed, or a change in direction. Indication / giving signals – the examiner will check to ensure you provide signals when necessary and at the appropriate time. You will also require knowledge or arm signals and when they should be used if necessary. Junctions – junctions require the use of the OSM PSL routine, that you use the correct position or lane, that you observe other road users and act accordingly. Overtaking – the examiner will check that before overtaking, you make the appropriate safety checks by using the OSM PSL routine, that you choose the correct time to overtake, overtake at an appropriate speed and that you do so in a way that doesn’t cause any other road users inconvenience. Safe following distances – you should use a system such as the 2 second rule. The examiner will be checking that you anticipate changing situations and that you are constantly adjusting your following distance based on road and traffic and weather conditions. Lane discipline – the examiner will assess your ability to plan ahead so that you choose the correct lane in good time and correctly observe traffic around you before changing direction. Lane positioning – the examiner will assess your lane position, checking that choose a lane position to remain clear of hazards and that you position your motorcycle correctly for the direction you intend on taking. Selecting a safe place to stop – this will require that you select a safe, convenient and legal place to stop and one that doesn’t inconvenience other road users. The examiner will also check to ensure you make all observational checks before doing so.